If I had my way, my morning routine would be about a three-hour affair. I love quiet, leisurely mornings and most of the time they end in a filling, whole-grain breakfast. This spelt porridge takes a bit of time but it's primarily hands-off cooking. If you've never tried spelt in the morning, it's a favorite breakfast grain of mine. Take for example these doughnuts, pancakes, dutch baby, and waffles. The key to a creamy porridge with spelt is the same method I use for making risotto: cracking the grain. Unlike risotto, I crack the grain a bit smaller. I like the texture to be somewhere between steel cut oats and cream of wheat (a old family favorite). Best of all, you can make it as thick (or not) as you like. Simply watch the amount of liquid you add towards the end of cooking. 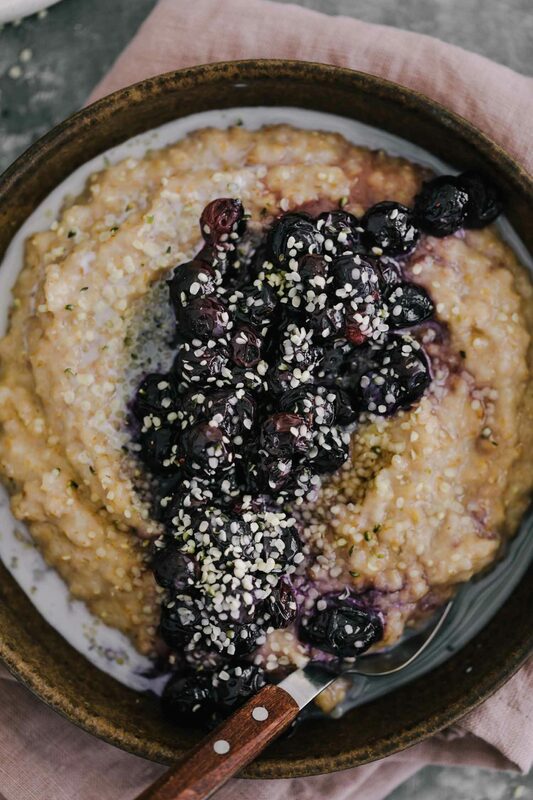 The post Spelt Porridge with Roasted Blueberries appeared first on Naturally Ella.